Raith dropped two further points in the Scottish Championship League race this evening, in an eventful but ultimately frustrating 1-1 draw at home to visitors Alloa. 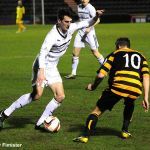 Despite having enough chances and good quality possession to win the game, and for all Raith’s effort in midfield, Alloa proved too hard a nut to crack for Grant Murray’s men to take all three points. 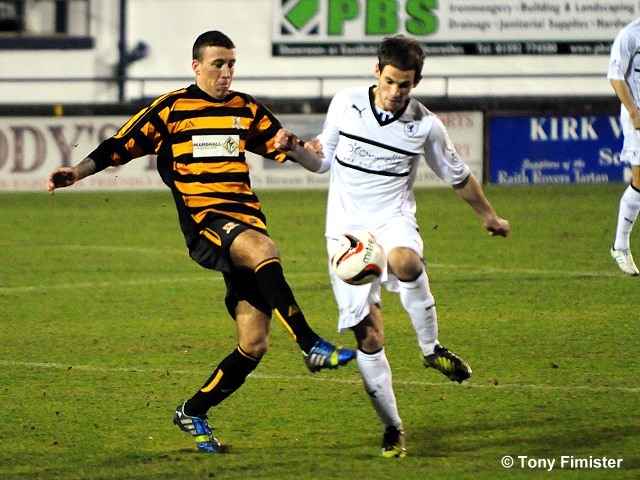 As during the teams’ last meeting in November, Alloa proved obdurate opponents. Raith won no shortage of tackles in midfield, and only rarely looked under pressure; however, a combination of an early strike from the visitors and a succession of squandered half-chances from the home side ensured that the 978 hardy souls in attendance were denied a warming home victory. Grant Murray made one change from the starting eleven who performed so well at Dumbarton at the weekend – Dougie Hill returning to the back four with Reece Donaldson dropping to the bench. 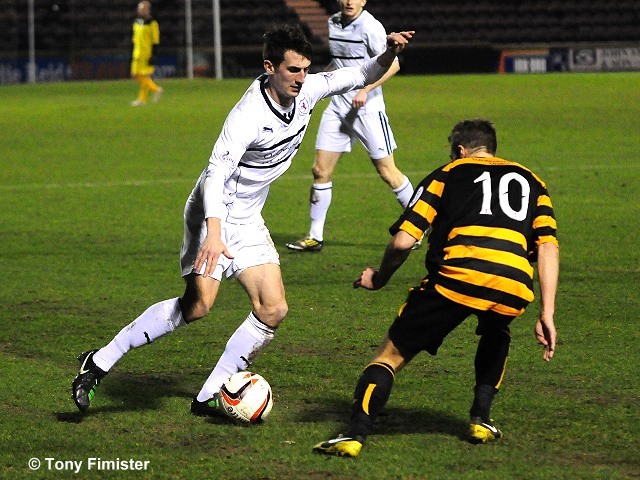 Recent signing John Baird continued up front, partnering Gordon Smith. Calum Elliot returned to the side, taking his place amongst the substitutes. 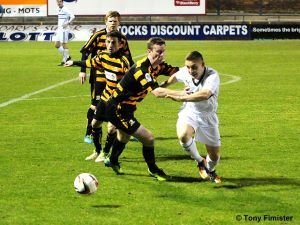 For Alloa, Saturday’s win at Greenock was their first victory since playing Morton previously in mid-December. Former Celtic and Hibernian striker Derek Riordan again took his place amongst the Wasps’ substitutes. Fans needing a reminder of how fortunes can change in football needed only to look at the league table the last time Raith and Alloa met in November – whilst Alloa took all three points that day, the teams occupied third and fourth places in the league table respectively. While supporters can take positives from most eventualities, none could deny both teams are struggling for form. The home side were busiest in the early exchanges. As noticeable as Cardle’s control and Anderson’s prowess in the air were, also eye-catching was Alloa’s lack of control through the midfield. Consistently gifting possession to Raith or proving weaker in the tackle than their opponents, Alloa undermined themselves regularly in the opening stages. 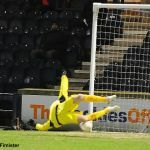 Smith was unable to shoot following good work from Anderson and Baird, Alloa goalkeeper Bain collected well from a zipping Cardle cross, and Cardle and Smith’s slick one-two nearly resulted in a shooting opportunity on the edge of the visitors’ area. 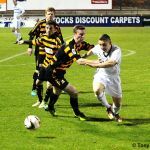 Although Raith hadn’t created a clear chance, Callachan and Moon in the centre of the park established their authority early over their Alloa counterparts, Simmons and McCord. Ross Callachan particularly has grown into a strong midfield presence since breaking into the first team in late November. Excellent in the recent Cup win at Easter Road, Callachan was a buzzing figure in the early stages here, snapping into tackles, retrieving possession, and distributing smartly. 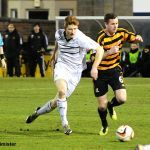 From one such intervention, Cardle released Smith who looked to shoot before being bundled over by a combination of Alloa centre-halves Gordon and Lindsay – half-hearted penalty claims came from the home fans, but not the players. 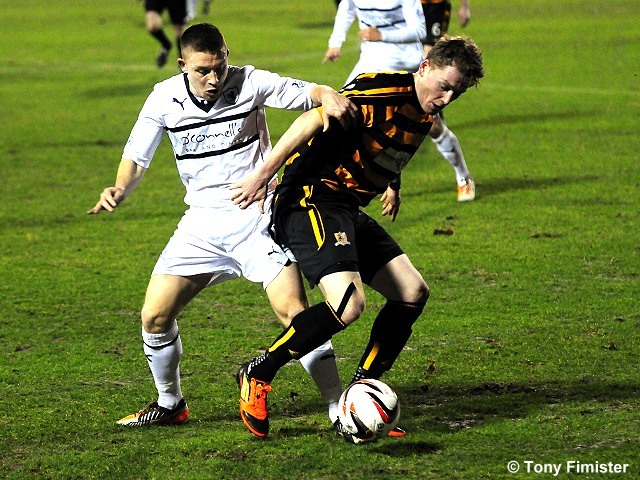 Against the run of play, and coming as a result of their first attack of the half, Alloa led in 24 minutes. A high cross allowed rangy centre-half Lindsay to head back across goal. 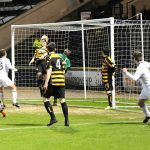 Although Raith ‘keeper Robinson clutched the dipping header, his poor clearance led to Lindsay feeding Ferns running in on goal – the Alloa striker finished clinically from 20 yards. Losing a goal in such circumstances often galvanises the scorers and causes the dominant side to wobble. 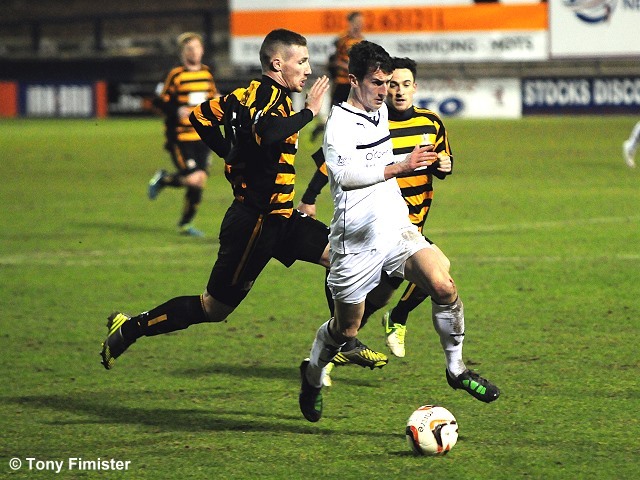 That was the case here – Alloa seemed invigorated by their lead, and Raith’s concentration ebbed away. Alloa’s Cawley sneaked beyond Thomson and shot powerfully, Robinson gathering low down to his left. Raith fought their way back into some degree of superiority – Smith headed weakly at Bain, and Cardle blazed over having created space on the edge of the area. 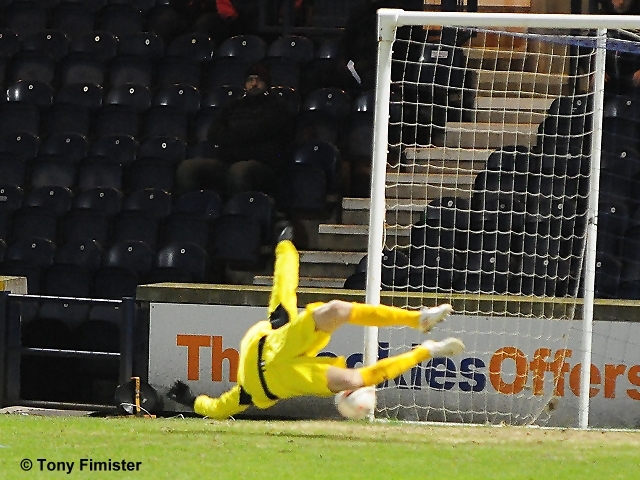 With their best chance of the half, a flashing cross from the Raith no.7 was nodded just wide by Ellis. While Raith’s build-up play regained some of its earlier sharpness as half-time approached, there was a tangible lack of threat in the final third. This was epitomised with two minutes to go before the break – Anderson and Baird combined to strip McCord of possession, allowing Callachan space to run at the Alloa back-four. 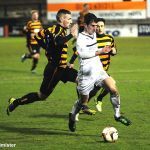 The ball made its way wide to Booth, then to Cardle – by the time space to cross was created, Alloa were back in sufficient numbers and the chance and any attacking momentum had vanished. Greater dividends may have rewarded more direct attacking play. The home fans made their displeasure known at the half-time whistle, although more in frustration than in a genuine show of feeling against the home side. A goal down to some sloppy defending at Alloa’s one clear-cut chance, it felt as though Raith had enjoyed the lion’s share of possession yet trailed at the break. Grant Murray obviously impressed on his side the need for a high tempo from the outset of the second half. Leading by example, skipper Jason Thomson collected a loose ball and made for the by-line, skipping past four half-hearted Alloa challenges – his centre rolled agonisingly across the six-yard box without the finish the run deserved. For all the passing and movement in the first half, and the energy shown moving the ball from midfield to the front two, Raith’s 54th minute equaliser when it came was a simple affair. Following a blocked cross, Cardle’s high far-post corner was met by Hill, who’s looping header back across Bain found the corner of the net. 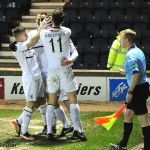 The big defender’s fourth goal of the season put Raith on equal terms in a match in which the home side had been on top for long spells – the home fans wished for Raith to capitalise and ensure the three points would remain in Kirkcaldy. Further chances followed. A Booth surge into the box resulted in another corner, Simmons nodded away Anderson’s tempting cross, and neither Baird nor Smith could provide a finish when Booth again intruded deep into Alloa’s defensive lines. An unsavoury incident followed on the hour – Booth released Cardle, who went down in the box under Simmons’ challenge. Referee Muir awarded a goal-kick, deeming the challenge not worthy of a penalty, and Cardle’s efforts not sufficient to constitute simulation. Unwisely, the players tangled in the aftermath and contact was made between the two. Muir sensibly booked both, and sent both back to their positions. 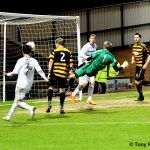 Alloa have only conceded 30 goals this season, lower than many of their rivals in the mid- and lower reaches of the Championship table. 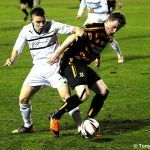 Despite losing four to Raith and five to Dumbarton earlier in the campaign, commonly Alloa have proved hard to break down. The central defensive duo of Lindsay and Gordon – while not easy on the eye – have proved hard-working and dependable. Both were booked, along with McCord, Doyle, and substitute Caddis, as referee Alan Muir cracked down on several uncompromising challenges. The introduction of Calum Elliot as a replacement for the hard-working Gordon Smith gave Raith further impetus as the game moved into its final quarter. A Thomson shot was blocked away, Baird nearly fashioned a chance under close scrutiny from Lindsay, and Callachan rasped a shot just over. Within moments of coming on, Elliot’s shot across a crowded six-yard box was hoofed clear by Holmes with Baird waiting to pounce. At the other end, Alloa had some forays toward Robinson’s goal, a Simmons cross being headed clear by Hill at full stretch. But overall it was Raith who were more consistent in their pressure. A thumping drive from Callachan was well turned over by Bain, and Elliot’s drive from a free-kick again stung the palms of the visiting keeper. In the last minutes, with Raith sensing two points slipping away and Alloa mounting a last stand, the fluidity of some of Raith’s midfield play understandably gave way to more direct and deeper passes into Alloa territory. Hill nearly connected with a Cardle corner, and the same player tested Bain from an unlikely distance as another Raith move broke down. By the final whistle, there was a sense of anti-climax at a game that had promised so much following Raith’s equaliser relatively early in the second half, but ultimately had delivered only the one league point. Rovers dominating possession and chances. a goal down to sloppy football. Alloa have created nothing. Frustrating. 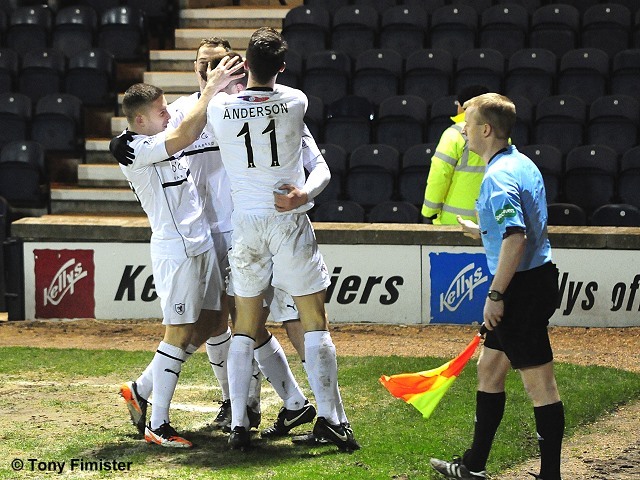 RAITH: Robinson, Thomson, Booth, Hill, Cardle, Moon, Anderson, Callaghan, Smith, Ellis, Baird. Subs: Fox, Spence, Elliot, Donaldson, Mullen, Vaughan, Laidlaw. 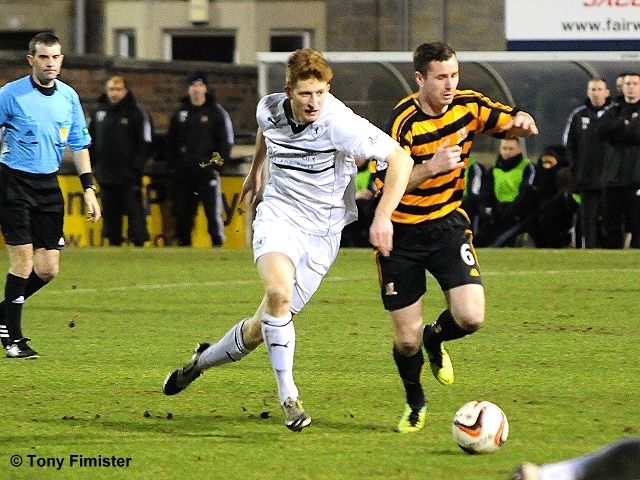 ALLOA: Bain, Doyle, Meggatt, Gordon, Lindsay, Simmons, Cawley, McCord, Ferns, Holmes, Tiffoney. Subs: Young, Caldwell, Caddis, Flannigan, Riotdan, Kirk, McDowall. 5 Edward Ferns beats Robinson . 9 Hill scores the equaliser. 11 Grant Anderson on a run. 12 Bain tips a Raith effort over the bar.